The finest collection of Jimmy Witherspoon's gospel songs, Feelin' the Spirit is an essential addition to any Witherspoon collection. 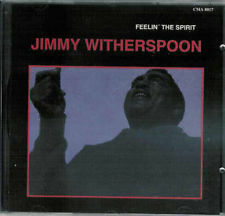 Throughout his career, Witherspoon recorded numerous gospel songs, frequently recording two or three songs for his albums. This set, collecting many of his finest early performances, is frequently revelatory. Witherspoon's voice and style are so distinctive that they make these songs seem new, even on standards such as "Amazing Grace" and "Rock of Ages." Never strictly a gospel artist, all of these recordings show sincerity and, more importantly, depth, both musically and spiritually.